Bladder cancer, arising from the epithelial lining (i.e., the urothelium) of a urinary bladder, is one of the most common malignancies of the urinary system.1-3 Current treatments for bladder cancer include surgery, radiotherapy, and chemotherapy, but the mortality is still high.4 Therefore, more efficient strategies are needed to improve therapeutic efficacy for bladder cancer. To enhance the efficacy of PDT for bladder cancer, it is necessary to develop effective strategies to supply adequate O2 for ameliorating hypoxia. One strategy to address this issue is to deliver additional O2 into the hypoxic tumor tissues by hyperbaric oxygen inhalation or by using O2-containing nanomaterials.31,32 More recently, another smart strategy was proposed to alleviate tumor hypoxia by in situ producing O2, which took advantage of tumor-specific microenvironment characteristics (i.e., higher level of H2O2 and more acidic pH).33-37 Since the hypoxia-driven metabolic changes in bladder cancer cells also produce higher levels of H2O2 and promote acidosis,38-41 we reason that the efficacy of PDT for bladder cancer would be significantly enhanced by in situ producing O2 from H2O2. In this work, we reported an effective strategy to improve the efficacy of PDT for bladder cancer by ameliorating hypoxia with O2-generating HSA-MnO2-Ce6 NPs (Scheme 1). Redox-active MnO2 NPs were chosen due to their high reactivity toward H2O2 to produce O2. MnO2 NPs themselves would be decomposed under acidic pH to release Mn2+ for magnetic resonance (MR) imaging.42-45 Ce6 (chlorin e6), an excellent PDT photosensitizer with a high 1O2 quantum yield and near-infrared (NIR) fluorescence, and HSA (human serum albumin), a well-known drug carrier protein with excellent biocompatibility, were used together with MnO2 to fabricate HSA-MnO2-Ce6 NPs.46-49 In vitro study revealed that the NPs exhibited remarkable PDT efficacy due to their high oxygen production efficiency. In vivo study, using an orthotopic bladder cancer mouse model, demonstrated that abundant O2 was in situ generated in the tumor tissue after systemic intravenous (i.v.) injection of HSA-MnO2-Ce6 NPs. More notably, when PDT treatment of orthotopic bladder cancer was carried out using HSA-MnO2-Ce6 NPs, more complete ablation of bladder cancer was achieved and significantly prolonged lifetime of mice was observed. Schematic representation of the synthesis of HSA-MnO2-Ce6 NPs (a) and their application in enhanced PDT therapy for orthotopic bladder cancer by ameliorating hypoxia (b and c). HSA: human serum albumin; Ce6: chlorin e6; NPs: nanoparticles; i.v. : intravenous. HSA was obtained from CSL Behring AG (Switzerland). Chlorin e6 (Ce6) was from Frontier Scientific (Logan, Utah, USA). Potassium permanganate (KMnO4) and hydrogen peroxide (H2O2, 30 wt%) were from Sino pharm Chemical Reagent Co. (China). 1-ethyl-3-(3-dimethylaminopropyl) carbodiimide (EDC) and N-hydroxysuccinimide (NHS) were from J&K Scientific Ltd. (China). 4',6-diamidino-2-phenylindole dihydrochloride (DAPI) and Singlet Oxygen Sensor Green (SOSG) probe were from Molecular Probes (USA). 1640 medium was from Gibco (Grand Island, NY, USA). The cell counting kit-8 (CCK-8) was from Dojindo Laboratories (Japan). 1×Phosphate buffer solution (PBS) and deionized water were used in the experiments. All C57BL/6 female mice (18-20 g) were obtained from Yangzhou University Medical Center. HSA-coated MnO2 NPs (HSA-MnO2 NPs) were prepared as follows.50 In brief, 6.32 mg KMnO4 dispersed in 0.6 mL water was drop-wise added into 50 mg HSA dispersed in 1.4 mL PBS. The mixture was stirred at 37 °C for 2 h to obtain HSA-MnO2 NPs. HSA-MnO2-Ce6 NPs were then prepared follows. First, the activated 4.5 mg Ce6-NHS ester mixture (4.5 mg Ce6, 6.9 mg EDC, and 3.7 mg NHS added into 1 mL of DMSO, stirred for 8 h) was added into 2 mL HSA-MnO2 NPs solution. The mixture was then diluted to 10 mL by adding 7 mL PBS (VDMSO:Vaqueous = 1:9). The reaction mixture was stirred at room temperature for 20 h to allow the conjugation of Ce6 onto HSA-MnO2 NPs via the interaction between the carboxylic groups of Ce6 and the amine groups of the lysine residues within HSA. Due to the hydrophobic property of Ce6, the conjugates self-assembled into HSA-MnO2-Ce6 NPs. HSA-Ce6 NPs were prepared using HSA instead of HSA-MnO2 NPs, under conditions otherwise identical to those used for preparing HSA-MnO2-Ce6 NPs. The above three NPs solutions were further purified by removing free small molecules with an ultrafiltration membrane (molecular weight ~30 kDa). They were then filtered through a filter membrane (pore size 0.22 μm). The NPs dispersions were stored at 4 °C for further use. The morphology and particle size of NPs were measured by transmission electron microscopy (TEM) (Hitachi H-7650). The NPs were dried on a copper grid coated with amorphous carbon and observed at 200 kV. The hydrodynamic size and zeta potential of the NPs were measured by dynamic light scattering (DLS; Brookhaven Instruments, USA). The colloidal stability of HSA-MnO2-Ce6 NPs was investigated in PBS (pH 7.4) at 37 °C by measuring their mean diameter with DLS. A UV-visible spectrophotometer (UV2450, Shimadzu Corp.) was used to measure the UV-visible spectra of NPs. Powder X-ray diffraction measurements were collected on Rigaku Ultima Diffractometer at 40 kV and 40 mA with a scan rate of 2°/min using Cu Kα radiation. Concentrations of MnO2 were measured using inductively coupled plasma atomic emission spectroscopy (Thermo). The concentration of Ce6 was calculated from its characteristic absorption peak at 665 nm. The final concentrations of Ce6 and Mn in HSA-MnO2-Ce6 NPs stock solution were 500 μg/mL and 10 mM, respectively. O2 generated by HSA-MnO2-Ce6 NPs was measured in a sealed chamber coupled with an oxygen electrode (Dissolved Oxygen Meter, AZ-8402, Guangdong, China) at 37 °C. HSA-MnO2-Ce6 NPs (200 μM MnO2) were dispersed in PBS, and the pre-dissolved O2 was removed by bubbling with N2 for 30 min. H2O2 (100 μM and 500 μM) was then injected into the chamber and the generated O2 was recorded at set time points. The O2 generation from H2O2 solution (100 μM) at different pH (6.5 and 7.4) by using HSA-MnO2-Ce6 NPs (200 μM MnO2) was also studied. The 1O2 generation under laser irradiation in the absence or presence of 100 μM H2O2 solution by HSA-Ce6 and HSA-MnO2-Ce6 NPs (1 μg/mL Ce6) was measured with an SOSG probe. In brief, SOSG dissolved in methanol was added to the samples to measure 1O2 generation, which were irradiated with a 660-nm laser (5 mW/cm2) in N2 atmosphere. The generated 1O2 was determined by measuring recovered SOSG fluorescence at 525 nm under 494 nm excitation. HSA-MnO2-Ce6 NPs at different Mn concentrations (0, 0.05, 0.1, 0.2, and 0.4 mM) in PBS were incubated at different pH (6.5 and 7.4) for 12 h before MR imaging. MR imaging was performed with a 7.0 T MRI scanner (BioSpec 70/20USR, Bruker, Germany). The longitudinal (T1) phantom images as well as relaxation time (T1) were recorded. Mouse bladder cancer cells (MB-49) were cultured in 1640 medium containing 10% fetal bovine serum, 1% penicillin, and 1% streptomycin at 37 °C in a CO2 incubator. MB-49 cells were seeded into 24-well chambers with cover glass at 2×104 cells/well and cultured for 24 h. To evaluate the cellular uptake of NPs, fresh medium containing HSA-Ce6 or HSA-MnO2-Ce6 NPs (2.5 μg/mL Ce6) was added. After 6 h co-incubation, cells were washed with PBS three times and fixed with 4% paraformaldehyde solution for 20 min, then stained for 15 min with DAPI. Confocal laser scanning microscopy (Leica TCS SP5, Germany) was used to observe fluorescence in cells. For cellular uptake experiments by flow cytometry, MB-49 cells were seeded in 6-well plates at 5×105 cells/well. The treatment was the same as for the above cell uptake experiments. Then, cells were washed with PBS three times and centrifuged, re-suspended in 500 µL PBS, and analyzed by flow cytometry. The fluorescence of Ce6 was collected on the APC-A channel. To evaluate the cytotoxicity of HSA-MnO2-Ce6 NPs, the hemolytic effect of HSA-MnO2-Ce6 NPs was first studied. Whole blood was collected from C57BL/6 mice. Red blood cells were isolated by centrifugation, then washed three times with PBS. The cells were treated with HSA-MnO2-Ce6 NPs, then centrifuged, and the absorbance of supernatants at 540 nm was measured. A sample treated with 1% Triton-X 100 (Sigma) in PBS was used as a 100% hemolysis standard. The cytotoxicity of HSA-MnO2-Ce6 NPs toward MB-49 cells was investigated by using CCK-8 assay as follows. The cells were seeded at 1× 104 cells/well in 96-well plates with 1640 medium containing 10% fetal bovine serum. After 24 h, the medium was replaced with 100 μL fresh medium containing different concentrations of HSA-MnO2, HSA-Ce6 or HSA-MnO2-Ce6 NPs. After 24 h, CCK-8 assay was used to evaluate cell viability. The photo-cytotoxicity of HSA-MnO2-Ce6 NPs was investigated by CCK-8 as follows. The cells were seeded at 1× 104 MB-49 cells/well in a 96-well plate using 1640 medium containing 10% FBS. After 24 h incubation, the medium was replaced with 100 μL fresh medium containing different concentrations of HSA-MnO2 NPs, HSA-Ce6 NPs or HSA-MnO2-Ce6 NPs. 6 h later, cells were washed with PBS and 100 μL fresh medium was added, then the cells were irradiated with a 660 nm laser (5 mW/cm2) for 30 min under N2 atmosphere. After 24 h incubation, CCK-8 assay was used to evaluate the cell viability. All mice received care following the guidelines of the Care and Use of Laboratory Animals and their use followed the terms of the Institutional Animal Care regulations and Use Committee of Nanjing University. All animal experiments were approved by the Administration Committee of Experimental Animals in Jiangsu Province and the Ethic Committee of Nanjing University. An orthotopic bladder cancer model was established with minimal invasiveness in C57BL/6 mice.51 A small cut (~2 mm) was made into the skin of the lower abdomen, and the bladder was found and clamped carefully by using smooth forceps. MB-49 cells (5×106) were injected into the bladder wall using a 1 mL syringe. Tumor growth in the bladder was confirmed visually 9 days later. 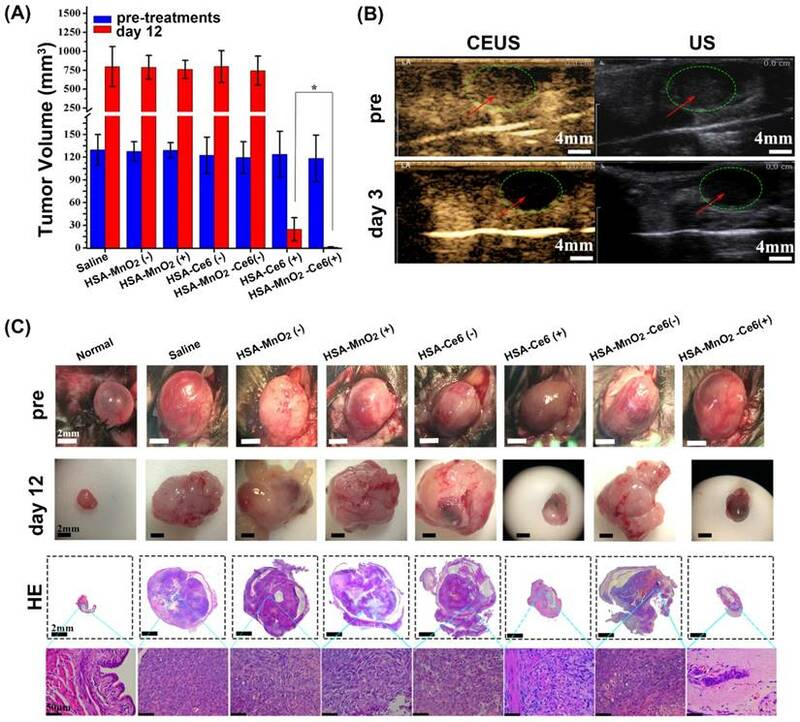 For near-infrared (NIR) fluorescence imaging, HSA-Ce6 or HSA-MnO2-Ce6 NPs (2.5 mg/kg Ce6) were administered via tail vein injection when the mouse bladder tumor size was ~110 mm3. For comparison, HSA-MnO2-Ce6 NPs (2.5 mg/kg Ce6) were administered via tail vein injection in normal mice. At 2, 12, 24, and 48 h after injection, images were obtained by an in vivo imaging system (IVIS Lumina, USA). Then, mice were sacrificed and the organs (heart, liver, spleen, lung, kidney, intestine, and bladder) were collected for imaging and semi-quantitative biodistribution analysis by using the imaging system. Emission spectra of Ce6 (710-900 nm) were obtained at a fixed excitation wavelength of 675 nm. Dye accumulation and retention in organs was evaluated by using the NIR analysis software Living Image 4.2. MRI was performed with a 7.0 T MRI scanner (BioSpec 70/20USR, Bruker, Germany). The T1-weighted MR images of bladder tumors were examined at 0, 4, and 24 h after intravenous injection of PBS or HSA-MnO2 or HSA-MnO2-Ce6 NPs (4.35 mg/kg MnO2) into mice with orthotopic bladder cancer. MR scanning parameters were: T1 propeller sequence, 1 mm slice thickness, TR/TE 789.8/10 ms, 3.0 cm field of view, and matrix 256(a). The relative signal intensity (RSI) was calculated from the ratio of signals in the bladder tumor area to those in normal tissue areas. The effect of HSA-MnO2-Ce6 NPs on oxygen content in bladder cancer was evaluated by using an in vivo oxygen probe (O2 Microsensor, Unisense, Denmark). Since the oxygen content probably varied with the depth of tumor tissue, the oxygen probe was inserted into bladder cancer tissues with a fixed depth of 2 mm. Then, the oxygen content of bladder tumors was measured at 0 h (pre-injection), 4 h, and 24 h after intravenous injection of HSA-MnO2-Ce6 NPs solution (8.7 mg/kg MnO2) or PBS. The relative tumor oxygen was calculated from the ratio of oxygen content in bladder cancer post- and pre-injection of the NPs. To further demonstrate the ability of HSA-MnO2-Ce6 NPs to improve the hypoxic environment of bladder cancer, a hypoxyprobe (pimonidazole, Hypoxyprobe-1 plus kit, Hypoxyprobe Inc.) was used to observe pimonidazole-stained hypoxic tumor areas visually. Mice with orthotopic bladder cancer were intravenously injected in the tail vein with PBS or HSA-MnO2-Ce6 NPs (8.7 mg/kg MnO2). After a predetermined time, bladders were surgically excised 90 min after intraperitoneal injection with pimonidazole hydrochloride (60 mg/kg). Frozen sections of bladders were created. The tumor sections were incubated with mouse anti-pimonidazole antibody (dilution 1:100, Hypoxyprobe Inc.) and Alex 488-conjugated goat anti-mouse secondary antibody (dilution 1:200, Jackson Inc.) as instructed. Nuclei were stained with DAPI. The bladder cancer volume was calculated using the formula a*(b/2)2, where a is the major axis and b the minor axis, upon exposure of the bladder. When the tumor size was ~125 mm3, treatments were started. Mice with orthotopic bladder cancer were divided into seven groups (4 mice in each group): PBS, HSA-MnO2 NPs, HSA-MnO2 NPs with laser irradiation, HSA-Ce6 NPs, HSA-Ce6 NPs with laser irradiation, HSA-MnO2-Ce6 NPs, and HSA-MnO2-Ce6 NPs with laser irradiation. Mice were injected with PBS or NPs via the tail vein (5 mg/kg Ce6, 8.7 mg/kg MnO2). The time 24 h after injection was designated as day 0. For laser irradiation treatment, bladders were exposed visually by making a small cut (about 2 mm) into the skin of the lower abdomen, then bladders were directly exposed to the laser. (Note, for future clinical translation, optical fibers plus endoscope techniques definitely will be more useful since the laser fiber can be inserted into the bladder via the urethra for PDT in bladder cancer). Bladders were irradiated by 660 nm laser for 15 min (200 mW/cm2) after day 0. The photodynamic effect of HSA-MnO2-Ce6 NPs on bladder cancer was detected on day 3 by contrast enhanced ultrasound (CEUS) and ultrasonography (US) imaging. The CEUS and US images were recorded after intravenous injection of microbubbles (SonoVue) according to a clinical CEUS protocol. CEUS, a diagnostic tool used in the clinic, is based on ultrasonography and uses stabilized microbubbles to improve the echogenicity of blood flow. Urinary red blood cell counts were measured to evaluate the photodynamic effect on hematuria. Urine samples of the PBS, HSA-Ce6 NPs and HSA-MnO2-Ce6 NPs groups with laser irradiation were collected on days 0, 6 and 12. Red blood cell counts were analyzed at the Laboratory Medicine of Nanjing Drum Tower Hospital. The body weight of each mouse was recorded. On day 12, mice were sacrificed, and the tumor size in the bladder was measured. Photographs were taken using a high-quality camera, and bladders were collected for hematoxylin and eosin (HE) staining and TUNEL assay. To further assess the in vivo safety of HSA-MnO2-Ce6 NPs, blood samples and organs of healthy C57BL/6 mice injected with PBS or HSA-MnO2-Ce6 NPs (5 mg/kg Ce6, 8.7 mg/kg MnO2) were harvested and analyzed on day 7 post-injection. From blood samples, hepatic function was evaluated by alanine aminotransferase (ALT) and aspartate aminotransferase (AST) levels and renal function by urea nitrogen (UREA) and creatinine (CREA) levels. The normal ranges of these parameters for female mice (<1 year old) are: ALT, 14-67 U/L; AST, 34-114 U/L; UREA, 7-16 mM; and CREA, 1545 μM.52 Five organ tissues (heart, liver, spleen, lung, and kidney) were collected for HE staining. The H2O2 concentration in bladder cancer tissues was measured using a Hydrogen Peroxide Assay Kit (Nanjing Jiancheng Bioengineering Institute, China). Tumor tissues were collected form mice bearing orthotopic bladder cancer. PBS was added to tumor tissues to prepare homogenate. The supernatant was then collected after centrifugation. The measured H2O2 concentration in bladder cancer tissues was 715.7±304.6 μM, which was high enough to generate O2 in tumor by reacting with MnO2. Statistical analysis involved two-sided Student t test for two groups and one-way ANOVA for multiple groups. P < 0.05 was considered statistically significant. The synthesis of HSA-MnO2-Ce6 NPs is illustrated in Scheme 1. First, HSA-MnO2 NPs were obtained via the reduction of KMnO4 with HSA.50 Next, the carboxylic groups of Ce6 were conjugated with the amine groups of the lysine residues within HSA to form HSA-MnO2-Ce6 NPs.53 The molar ratio of Ce6 to MnO2 in HSA-MnO2-Ce6 NPs was 0.084:1. The formation of HSA-MnO2-Ce6 NPs as well as HSA-MnO2 and HSA-Ce6 NPs was investigated by measuring their UV-visible absorption spectra. Compared to HSA-Ce6 NPs, HSA-MnO2-Ce6 NPs showed a new UV-visible absorption band around 300-400 nm (Figure 1a), which could be attributed to the surface plasmon band of MnO2.54 DLS (dynamic light scattering) revealed the mean size of HSA-MnO2, HSA-Ce6, and HSA-MnO2-Ce6 NPs as 18.5±4.8 nm, 112.8±7.4 nm and 118.6±8.1 nm, respectively (Figure 1b). The PDI (polydispersity index) of HSA-MnO2, HSA-Ce6, and HSA-MnO2-Ce6 NPs was 0.091±0.013, 0.101±0.012, and 0.104±0.019, respectively. All three NPs were generally spherical in shape with good mono-dispersity (Figure 1c) and their zeta potentials were -21.3±1.5 mV, -27.1±1.6 mV and -24.8±1.0 mV, respectively (Figure S2). In 30 days, the size of HSA-MnO2-Ce6 NPs in PBS at 37 °C remained constant (~120 nm) (Figure S3), indicating their excellent colloidal stability. We first tested whether HSA-MnO2-Ce6 NPs could generate O2 in vitro on reaction with H2O2 at endogenous levels (100 μM or 500 μM). As shown in Figure 2a, O2 was efficiently produced from H2O2. Longer reaction time or higher concentration of H2O2 generated more oxygen (Figure 2a). As indicated in Equation 2 and 3, acidic pH would promote O2 generation from both MnO2 and H2O2.45 Thus, we measured the O2 generation at different pH (6.5 and 7.4) in the presence of HSA-MnO2-Ce6 NPs (Mn, 200 μM) and H2O2 solutions (100 μM). As shown in Figure 2b, the O2 generation triggered by HSA-MnO2-Ce6 NPs was faster at pH 6.5 than 7.4, owing to the higher reaction rate of MnO2 with H2O2 under lower pH. (a) UV-visible absorption spectra of HSA-MnO2, HSA-Ce6, and HSA-MnO2-Ce6 NPs in PBS. Inset: photograph of the three NPs dispersed in PBS. (b) Size distribution of the three NPs by DLS. (c) TEM images of the three NPs. (a) O2 generation from different H2O2 solutions (100 μM and 500 μM) after adding HSA-MnO2-Ce6 NPs (Mn concentration 200 μM). (b) O2 generation at different pH values (6.5 and 7.4) from H2O2 solutions (100 μM) with HSA-MnO2-Ce6 NPs. (c) 1O2 generation with HSA-Ce6 and HSA-MnO2-Ce6 NPs in the absence or presence of H2O2 under NIR laser irradiation (660 nm laser, 5 mW/cm2) under N2 atmosphere. (d) T1-weighted MR images of HSA-MnO2-Ce6 NPs of various concentrations at different pH (6.5 and 7.4). (e) Longitudinal relaxation rate (r1) of HSA-MnO2-Ce6 NPs at pH 6.5 and 7.4. Error bars indicate standard deviations of three independent measurements. Because oxygen is a key element in the process of PDT, the yield of 1O2 highly depends on O2 content.8 Considering the effective O2 generation in the mixture of H2O2 with HSA-MnO2-Ce6 NPs, we measured the 1O2 generation under laser irradiation in the presence of HSA-MnO2-Ce6 NPs and H2O2 with a singlet oxygen sensor green (SOSG) probe. The 1O2 generation with HSA-Ce6 NPs was measured as a comparison. Both HSA-Ce6 and HSA-MnO2-Ce6 NPs showed similar 1O2 generation efficiency in the absence of H2O2 (Figure 2c). HSA-MnO2-Ce6 NPs showed a two-fold enhancement of laser-induced 1O2 generation in the presence of H2O2, which was due to the MnO2-triggered generation of O2. In contrast, 1O2 production with HSA-Ce6 NPs did not differ in the absence or presence of H2O2. These results demonstrated that the PDT efficiency of HSA-MnO2-Ce6 NPs would be significantly improved in the presence of H2O2. Because Mn2+ is an excellent T1-shortening agent in MRI, we investigated the ability of HSA-MnO2-Ce6 NPs as contrast agents for MRI. HSA-MnO2-Ce6 NPs in PBS were incubated at different pH values (6.5 and 7.4) for 12 h before MRI. MRI revealed that the T1-weighted signals were manganese concentration-dependent, with higher concentrations appearing brighter (Figure 2d and 2e). The T1-weighted signal of HSA-MnO2-Ce6 NPs was much higher at pH 6.5 than 7.4, and the longitudinal relaxivity (r1) value was also increased from 1.85 mM-1s-1 at pH 6.5 to 8.36 mM-1s-1 at pH 7.4. The much lower relaxivity of the NPs at pH 7.4 was attributed to the higher valence (IV) of manganese and shielding paramagnetic centers inaccessible to water molecules.42,55,56 The remarkably increased relaxivity of the NPs at pH 6.5 was owing to the decomposition of MnO2 into paramagnetic Mn2+ (Figure S4). 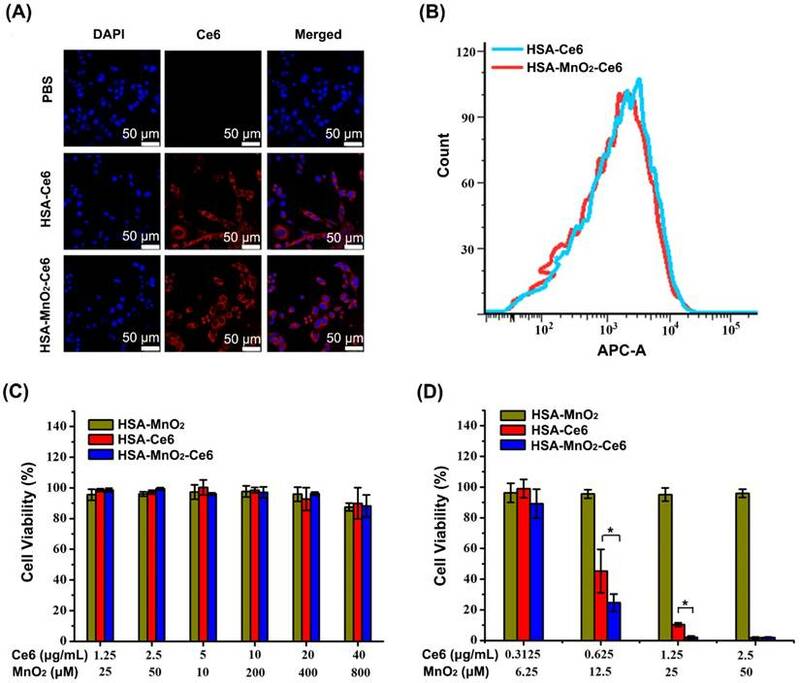 We investigated the cellular uptake efficiency of HSA-Ce6 and HSA-MnO2-Ce6 NPs. Both NPs were incubated with mouse bladder cancer cells (MB-49) for 6 h and observed by confocal microscopy and flow cytometry. 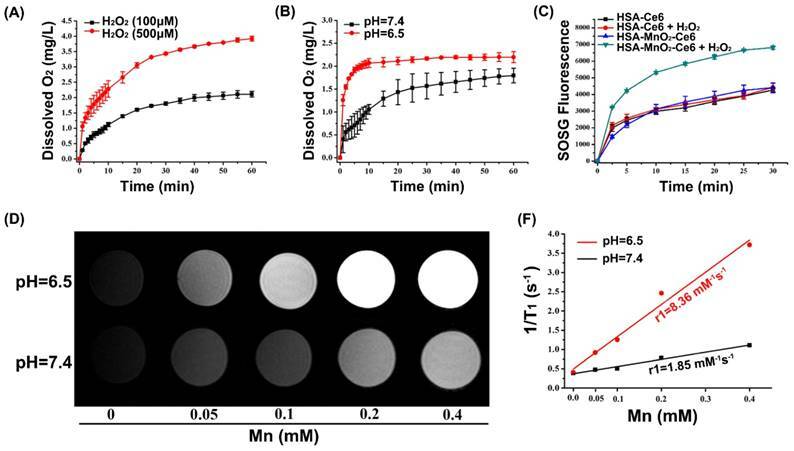 Cells treated with HSA-Ce6 and HSA-MnO2-Ce6 NPs presented strong Ce6 red fluorescence in the cytoplasm, whereas those treated with PBS showed no Ce6 fluorescence (Figure 3a, 3b, and S5). Flow cytometry results revealed approximately equal cellular uptake of HSA-Ce6 and HSA-MnO2-Ce6 NPs. Given the abnormally increased concentrations of H2O2 in bladder cancer cells,41 the uptaken HSA-MnO2-Ce6 NPs could react with endogenous H2O2 to produce O2 in situ, which would in turn enable the enhanced PDT for bladder cancer. (a) Confocal fluorescence images of MB-49 bladder cancer cells after 6 h incubation with HSA-Ce6 and HSA-MnO2-Ce6 NPs. Blue fluorescence indicates positive staining of DAPI, and red fluorescence is Ce6. (b) Flow cytometry of MB-49 cells incubated with HSA-Ce6 or HSA-MnO2-Ce6 NPs. (c) Relative viability of MB-49 bladder cancer cells after incubation with various concentrations of NPs for 24 h. d) Relative viability of MB-49 cells after incubation with NPs under laser irradiation (660 nm, 5 mW/cm2, 30 min) under N2 atmosphere. Error bars indicate standard deviations of three independent measurements. (*p < 0.05). We first investigated the hemolytic effect of HSA-MnO2-Ce6 NPs on mice red blood cells. As shown in Figure S5, HSA-MnO2-Ce6 NPs did not induce significant hemolysis, indicating their good biocompatibility. We next tested the cytotoxicity of HSA-MnO2, HSA-Ce6, and HSA-MnO2-Ce6 NPs under the dark condition (Figure 3c). Bladder cancer cells showed no obvious cytotoxicity upon treatment with all three NPs for 24 h under dark. We further tested the in vitro PDT efficiency of the NPs by cell viability assay (Figure 3d). With Ce6 concentrations of 0.625 μg/mL and 1.25 μg/mL, treatment with HSA-MnO2-Ce6 NPs resulted in 75.35±5.67% and 97.92±0.93% cell death, and treatment with HSA-Ce6 NPs resulted in 54.76±14.17% and 89.70±1.22% cell death. In addition, HSA-MnO2 NPs showed no obvious photocytotoxicity for cells. These in vitro results demonstrated that HSA-MnO2-Ce6 NPs exhibited the best PDT effects for bladder cancer cells. After the establishment of the orthotopic bladder cancer model in C57BL/6 mice (Figure S6),51 the distribution of HSA-Ce6 and HSA-MnO2-Ce6 NPs in C57BL/6 mice was evaluated by NIR imaging. The fluorescence of Ce6 distributed widely throughout the mouse body after 2 h injection of the NPs (Figure 4a and 4c). Subsequently, HSA-Ce6 and HSA-MnO2-Ce6 NPs showed remarkable accumulation in the bladder area (black dotted circles) in mice with orthotopic bladder cancer at 24 h and 48 h. In contrast, the mice with a normal bladder did not show obvious accumulation of HSA-MnO2-Ce6 NPs in the bladder area. Ex vivo imaging of excised major organs at 48 h post-injection were investigated (Figure 4b and 4d). Strong Ce6 fluorescence intensity appeared in tumor-bearing bladders, with barely no fluorescence intensity in normal bladders, which indicated excellent in vivo tumor targeting of the NPs. To further prove high tumor uptake of the NPs, we measured stained bladder cancer slices. As the confocal images showed, the fluorescence intensity of the NPs was high in bladder cancer tissues, but no fluorescence of NPs was observed in bladder wall (Figure S8). Therefore, this confirmed that the NPs were accumulated in the tumor region instead of in normal bladder tissues. (a) Fluorescence images of C57BL/6 mice with orthotopic bladder cancer injected with HSA-Ce6 or HSA-MnO2-Ce6 NPs, and normal mice injected with HSA-MnO2-Ce6 NPs (black dotted circles indicate the bladder area in body surface projection). (b) Ex vivo fluorescence images of major organs from mice at 48 h. (c) NIR fluorescence intensities of bladder areas at different time intervals based on in vivo fluorescence images shown in (a). 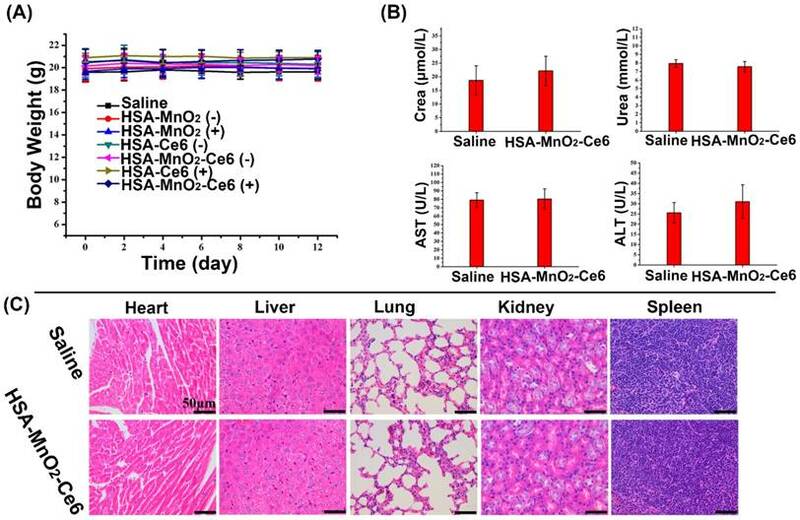 (d) Semi-quantitative biodistribution of HSA-Ce6 or HSA-MnO2-Ce6 NPs in major organs. Error bars indicate standard deviations of three independent measurements. (a) In vivo MR images of mice with orthotopic bladder cancer after intravenous injection of PBS or HSA-MnO2 or HSA-MnO2-Ce6 NPs at 0, 4, and 24 h. Areas in blue dotted circles represent the tumors in bladders. (b) Relative signal intensity of bladder areas at different time intervals based on MR images shown in (a). Relative signal intensity (RSI) was calculated from the ratio between signals in tumor areas and normal tissue areas (***p < 0.001). Error bars indicate standard deviations of three independent measurements. The T1-weighted MR images of bladder cancers were examined after intravenous injection of PBS or HSA-MnO2 or HSA-MnO2-Ce6 NPs into mice with orthotopic bladder cancer at 0, 4, and 24 h (Figure 5a). Bladder cancer tissue and normal tissue did not differ in T1-weighted signal intensity before injection. However, the intensity was significantly increased in the bladder cancer area at 4 h after injection with HSA-MnO2 NPs (RSI=2.20±0.14) or HSA-MnO2-Ce6 NPs (RSI=2.06±0.10) at 4 h or 24 h but not with PBS. Moreover, the enhanced T1-weighted signal intensity in bladder cancer areas lasted for 24 h after injection with HSA-MnO2 NPs (RSI=2.07±0.21) or HSA-MnO2-Ce6 NPs (RSI=2.19±0.15). The results further confirmed the accumulation of HSA-MnO2-Ce6 NPs in bladder cancer tissue, which may have great potential for MRI diagnosis of bladder cancer. 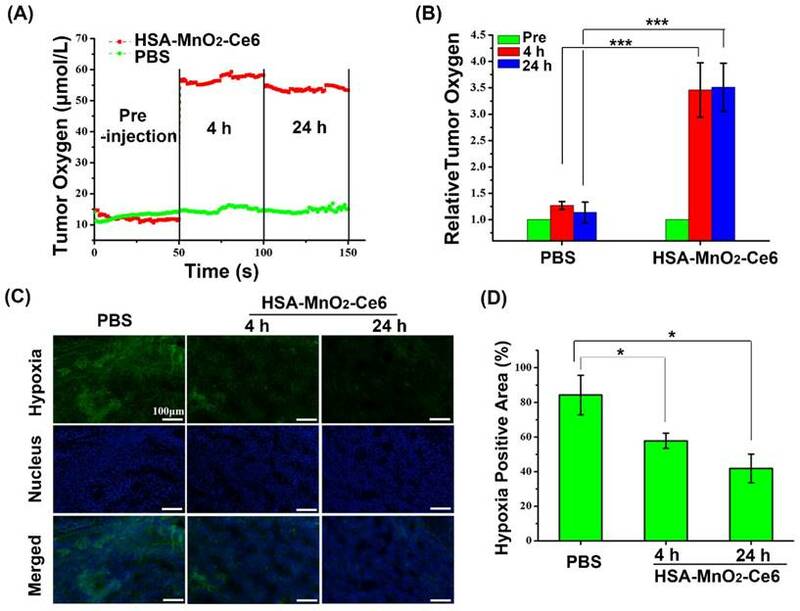 We evaluated the effect of HSA-MnO2-Ce6 NPs on oxygen content in orthotopic bladder cancer with an in vivo oxygen probe after intravenous injection of HSA-MnO2-Ce6 NPs solution. Oxygen concentration in bladder cancer tissues increased from 12 μM to 55 μM at 4 h after injection of HSA-MnO2-Ce6 NPs, and the oxygen concentration remained at 53 μM at 24 h after injection (Figure 6a). In contrast, the oxygen concentration with PBS injection showed no increase at 4 h and 24 h (oxygen level stable at ~15 μM). Quantitative analysis revealed that the tumor oxygen levels at 4 h and 24 h were increased ~3.5-fold after versus before the NPs injection (Figure 6b). The results suggested the excellent O2 generation by HSA-MnO2-Ce6 NPs, which significantly improved the hypoxia conditions of bladder cancer. To further confirm the ability of HSA-MnO2-Ce6 NPs to improve the hypoxic environment of bladder cancer, we used a hypoxia probe (pimonidazole) to visualize hypoxic tumor areas (Figure 6c and 6d). Clear changes in hypoxia were observed after treatment with HSA-MnO2-Ce6 NPs. Semi-quantification showed the tumors with PBS treatment remained highly hypoxic (84.26% positive area), with positive pimonidazole staining in most of the viable tumor area. In contrast, the tumors treated with HSA-MnO2-Ce6 NPs showed significantly decreased hypoxic areas (57.81% and 41.8% at 4 h and 24 h post-injection, respectively). The results could be attributed to the high tumor accumulation of the NPs, which allowed for sustained oxygen generation in the bladder cancer tissues. Such enhanced oxygenation in bladder cancer tissue could favor the increased PDT efficacy in vivo to overcome the hypoxia-associated photodynamic resistance. Mice with orthotopic bladder cancer were divided into seven groups: PBS, HSA-MnO2 NPs, HSA-MnO2 NPs with laser irradiation, HSA-Ce6 NPs, HSA-MnO2-Ce6 NPs, HSA-Ce6 NPs with laser irradiation, and HSA-MnO2-Ce6 NPs with laser irradiation. Tumor volumes of each group were ~120-130 mm3 before treatments (Figure 7a). All groups showed an obvious solid lesion in the bladder before treatment as compared with normal bladders (Figure 7c). Bladders were irradiated by 660 nm laser for 15 min (200 mW/cm2) after 24 h injection of the NPs (or PBS). The photodynamic effect of HSA-MnO2-Ce6 NPs for bladder cancer was detected on day 3 by CEUS. Before treatment, bladder cancer presented as a low heterogeneous echo mass on ultrasonography, and CEUS showed a significant enhancement in the bladder cancer area (Figure 7b). After therapy, bladder cancer presented as a much lower echo mass on ultrasonography, with no obvious enhancement in bladder cancer area on day 3 because the tumor vessels and tissues were completely damaged by the enhanced PDT. The therapeutic efficacy of HSA-MnO2-Ce6 NPs-enhanced PDT was further evaluated by monitoring tumor size and weight. On day 12, the bladder cancer of mice treated with HSA-MnO2-Ce6 NPs plus laser irradiation was significantly inhibited (p=0.02) (Figure 7a). This demonstrated the remarkably improved therapeutic efficacy as compared to other groups, including treatment with HSA-Ce6 NPs plus laser irradiation without the assistance of MnO2 to reduce tumor hypoxia. As shown in Figure S7, the bladder weight of mice without the photodynamic effect (PBS, HSA-MnO2 NPs, HSA-MnO2 NPs with laser irradiation, HSA-Ce6 NPs, and HSA-MnO2-Ce6 NPs) was significantly greater than those with the photodynamic effect (HSA-Ce6 and HSA-MnO2-Ce6 NPs both with laser irradiation) because the photodynamic effect significantly decreased tumor volume. However, the bladder weight did not differ between HSA-Ce6 NPs and HSA-MnO2-Ce6 NPs laser irradiation groups, probably due to incomplete absorption of damaged necrotic tumor tissue on the bladder on day 12. (a) O2 concentration in tumor before and after intravenous injection of HSA-MnO2-Ce6 NPs or PBS. (b) Tumor O2 levels before and after treatment (***p < 0.001). (c) Representative immunofluorescence images of tumor slices after hypoxia staining. Cell nucleus and hypoxic areas were stained with DAPI (blue) and anti-pimonidazole antibody (green). (d) Relative tumor hypoxia-positive areas before and after treatment for 4 h and 24 h, determined from immunofluorescence images in (c) (*p < 0.05). Error bars indicate standard deviations of three independent measurements. (a) Tumor volume before treatment and 12 days after treatment (bladders were exposed to 660 nm laser for 15 min (200 mW/cm2)), (*p<0.05). (b) Photodynamic effect of HSA-MnO2-Ce6 NPs on bladder cancer was detected pre-treatment and on day 3 by CEUS and US. (c) Representative images of orthotopic bladder cancers before and after treatments and corresponding HE-stained bladder sections. Error bars indicate standard deviations of four independent measurements. The high-quality bladder images and pathological HE bladder slices on day 12 after treatments are shown in Figure 7c. The bladder volumes from HSA-Ce6 and HSA-MnO2-Ce6 NPs laser irradiation groups were much smaller than those of the other five groups. This finding was due to the enormous space occupied by bladder lesions of the other five groups. The corresponding HE sections showed much larger residual bladder cancer areas in the HSA-Ce6 laser irradiation group than the HSA-MnO2-Ce6 NPs laser irradiation group. Moreover, bladders from the HSA-MnO2-Ce6 NPs laser irradiation group were similar to normal bladders. In the PBS, HSA-MnO2 NPs, HSA-MnO2 NPs with laser irradiation, HSA-Ce6 NPs, and HSA-MnO2-Ce6 NPs groups, bladders were full of large lesions that invaded into all layers of the bladder wall and even grew outside of the bladder. Detailed bladder images for comparison of the photodynamic effect between HSA-Ce6 and HSA-MnO2-Ce6 NPs are provided in Figure S8. The PDT treatment with HSA-MnO2-Ce6 NPs conferred an obvious brown necrotic tissue in the residual bladder cancer area, but a solid residual tumor was observed with HSA-Ce6 NPs-based PDT treatment. Corresponding HE and TUNEL sections showed larger tumor necrosis area and more cell apoptosis with HSA-MnO2-Ce6 NPs treatment, which suggested more complete tumor damage with HSA-MnO2-Ce6 NPs-enhanced photodynamic effect. In addition, the lifetime of mice was longer with HSA-MnO2-Ce6 than HSA-Ce6 NPs treatment, both with laser irradiation (Figure 8). 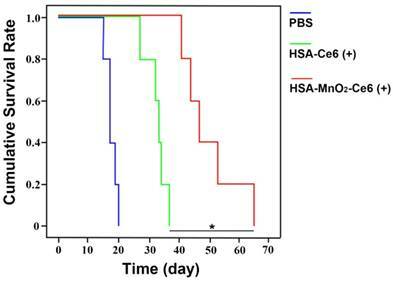 These results suggest that HSA-MnO2-Ce6 NPs may be a powerful PDT agent, superior to HSA-Ce6 NPs, because HSA-MnO2-Ce6 NPs significantly improved tumor hypoxia resulting from MnO2-triggered H2O2 decomposition. To evaluate the potential toxicity of HSA-MnO2-Ce6 NPs treatment, the body weight loss of mice was used as an indicator for treatment-induced toxicity. The body weight of mice did not differ with various treatments (Figure 9a). To further assess the in vivo safety of HSA-MnO2-Ce6 NPs, we analyzed blood samples and organs of healthy C57BL/6 mice injected with PBS or HSA-MnO2-Ce6 NPs (5 mg/kg Ce6, 8.7 mg/kg MnO2) on day 7 post-injection. Hepatic function was evaluated by ALT and AST levels and renal function by UREA and CREA levels. Levels of the four indicators did not differ between the two groups (Figure 9b). HE-stained sections of the five tissues (heart, liver, spleen, lung, and kidney) showed no apparent lesion (no necrosis, edema, inflammatory infiltration or hyperplasia) with PBS or the NPs injection (Figure 9c). These data suggested that PDT for orthotopic bladder cancer with HSA-MnO2-Ce6 NPs treatment did not induce significant damage in major organs. (a) Body weight of mice in different groups after treatments. (b) Hepatic function evaluated by ALT and AST levels and renal function by UREA and CREA levels. (c) HE staining of the five tissues (heart, liver, spleen, lung, and kidney). Error bars indicate standard deviations of four independent measurements. 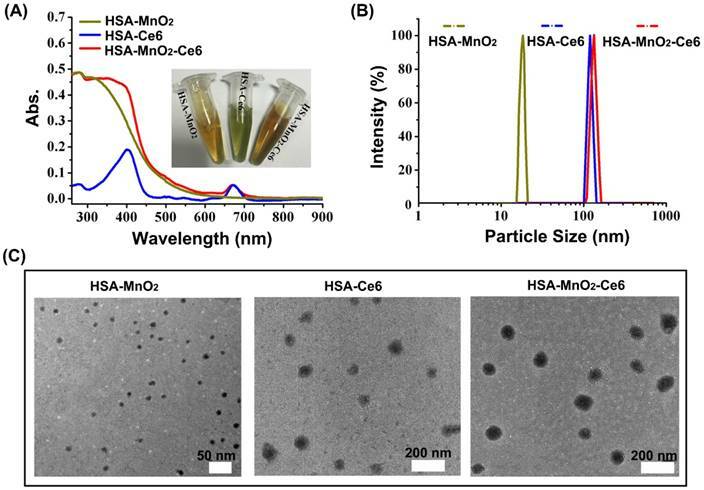 In summary, we successfully fabricated O2-generating HSA-MnO2-Ce6 NPs for enhanced photodynamic effect to treat bladder cancer by overcoming hypoxia. HSA-MnO2-Ce6 NPs have an excellent performance to generate O2 in vitro upon reaction with H2O2 at endogenous levels. 1O2 generation was two-fold higher with HSA-MnO2-Ce6 NPs with the addition of H2O2 under 660-nm laser irradiation, which enhanced the PDT effect on bladder cancer cells. In vivo NIR and MR imaging suggested the excellent bladder tumor targeting property of HSA-MnO2-Ce6 NPs. The tumor oxygen level increased ~3.5-fold after versus before injection of HSA-MnO2-Ce6 NPs in orthotopic bladder cancer, which improved the tumor hypoxia condition in bladder cancer tissue significantly. 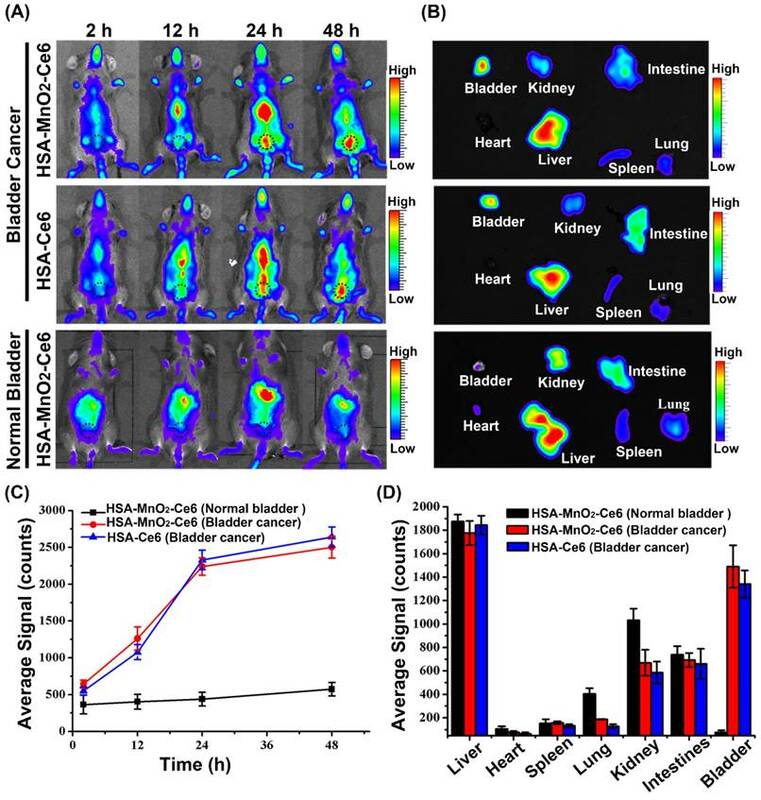 Given the negligible toxicity of HSA-MnO2-Ce6 NPs, they were further employed to treat orthotopic bladder cancer in mice combined with laser irradiation, showing remarkably improved therapeutic efficacy and significantly prolonged lifetime. The current study provides a promising strategy to design effective PDT agents for treating hypoxic bladder cancer. Moreover, in previous studies, subcutaneous tumor models were usually used. Here we used a more clinically relevant orthotopic bladder cancer model, which would have more clinical implications. Since hypoxia is a hallmark of most tumors, the currently developed method should be applicable to other tumors, which may help to address current clinical challenges. ALT: alanine aminotransferase; AST: aspartate aminotransferase; CCK-8: cell counting kit-8; CEUS: contrast enhanced ultrasound; Ce6: chlorin e6; CREA: creatinine; DAPI: 4',6-diamidino-2-phenylindole dihydrochloride; EDC: 1-ethyl-3-(3-dimethylaminopropyl) carbodiimide; H2O2: hydrogen peroxide; HSA: human serum albumin; KMnO4: Potassium permanganate; MRI: magnetic resonance imaging; MnO2: manganese dioxide; NHS: N-hydroxysuccinimide; NIR: near-infra-red; NPs: nanoparticles; O2: oxygen; 1O2: singlet oxygen; PBS: Phosphate buffer solution; PDT: Photodynamic therapy; RSI: relative signal intensity; SOSG: Singlet Oxygen Sensor Green; TEM: transmission electron microscopy; UREA: urea nitrogen; US: ultrasonography. Figure S1-S11 and associated discussion, references. This work was supported by grants from the National Natural Science Foundation of China (nos. 81572519, 81502203, 81772710, 81602221, 21722503, and 21405081), the Social Development Project of Nanjing (201503014), the Natural Science Foundation of Jiangsu Province (BK20160117), the Jiangsu Province Medical Youth Talent (QNRC2016017) and the “Summit of the Six Top Talents” Program of Jiangsu Province (SWYY-084). Corresponding authors: dr.ghqedu.cn. Tel: +86-136-0517-1690 (H.G.). weihuiedu.cn. Web: http://weilab.nju.edu.cn. Fax: +86-25-83594648. Tel: +86-25-83593272 (H.W. ).